Exercise can make arthritis worse. The correct answer is maybe. 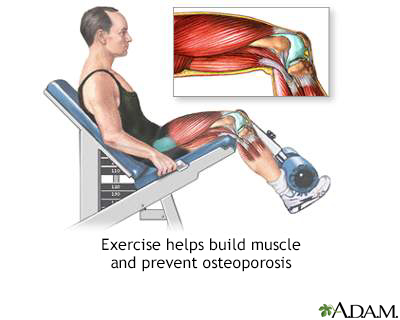 Getting regular exercise of the right kind is one of the ways to manage your osteoarthritis (OA). But some types of exercise can worsen your symptoms. Talk to your doctor or physical therapist about what kinds of exercises might work best for you and the right way to do them. Getting regular exercise can do which of the following? The correct answer is all of the above. Being active is good for your overall health and sense of well-being. People with arthritis who are active feel better than those who aren't. Getting regular exercise can also help improve blood flow, strengthen your heart, and help you maintain a healthy weight. Which type of exercise is best for people with OA? The correct answer is all of the above. Water exercises may be the best exercise for your arthritic joints. Walk on smooth, even surfaces, such as the sidewalks near your home or inside a shopping mall. Learn gentle exercises that will increase your range of motion and strengthen the muscles around your joints. How much moderate aerobic exercise should you get each week? The correct answer is 150 minutes. While this is a good goal to aim for, it may not always be possible if you are having symptoms. You may have good days and bad days, so pay attention to your body. Some weeks you may have to do less. Try walking, swimming, yoga, or Tai Chi. If you're not sure what to try, ask your health care provider. Strength training exercises aren't important for people with OA. The correct answer is false. Tired, weak muscles add to the pain or stiffness that arthritis causes. Stronger muscles also help you with balance. This helps prevent falls. Being stronger can also help you lose weight, sleep better, and give you more energy. Ask your doctor to recommend an exercise for you. The correct answer is all of the above. For the most benefit from balance exercises, try to do them at least three times a week. To help improve your balance, try tai chi, walking backwards, or standing on one foot. A physical therapist can help you learn the best exercises. Bicycling is a good exercise for people with OA. The correct answer is maybe. While cycling is low impact, if you have severe arthritis, using a bike may speed up damage to the cartilage and bone in your knee. Ask your health care provider if you can use a stationary bike. How often should you add more time to your workout? The correct answer is every three to four weeks. People with arthritis often need three to four weeks to adjust to a new activity level. Increase your activity in small amounts, about 10 minutes at a time, and let your body adjust to the new amount of time before doing more. If you're having a bad day, it's best to skip exercising. The correct answer is false. While there may be days when you can't exercise, first try to change your activity. Cut back on the time or number of days, or try a different exercise. Taking acetaminophen (Tylenol) or another pain pill before exercising is okay. But don't overdo it, because the medicine may mask pain. The correct answer is any of the above. Having a small amount of pain or swelling after exercise is normal. But if you have any of these symptoms, stop exercising and see your doctor right away.